We’ve included a lot of ECE community events for you in this newsletter. I wanted to bring your attention to two surveys included with a response deadline today — requested on behalf of the National Governor Association and the Council of Chief State School Officers — the surveys focus on best supports and greatest challenges to you as an early care educator. See more details under “Survey” below. Thanks to Sharon Ng of Parents for Public School, SF for a workshop at our last ECESF Community meeting on the transition process to SFUSD kindergarten. Here is her presentation with key dates, steps for round 2, and contact information. Our next ECESF Community Meeting is on March 25. 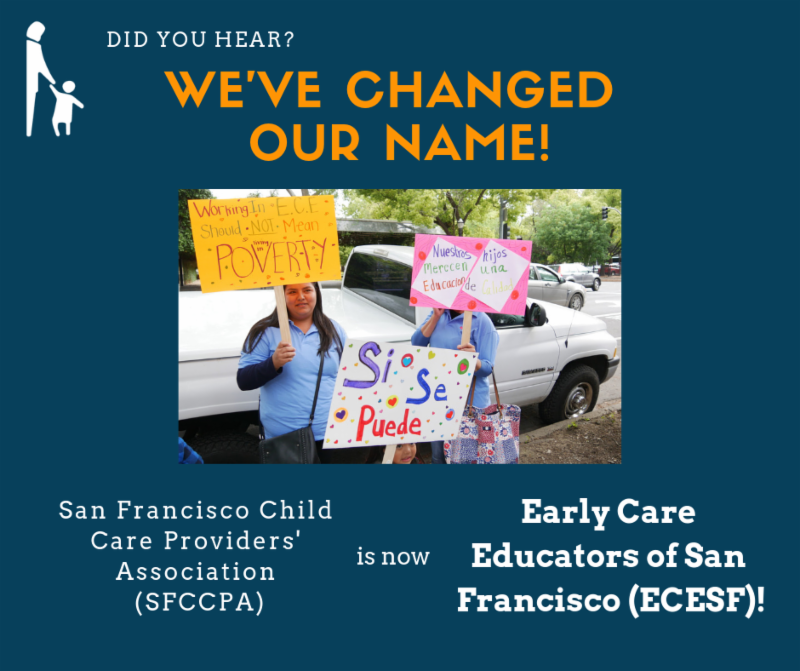 We’ll focus on highlights of a Budget Justice Training, and our local child care planning council's (CPAC’s) policy asks — what are key dates and where is ECE funding in the SF budget? We also have a guest, Claudia Quiñonez of Children’s Council, who will show us through their newly launched Child Care Finder. Here’s a quick summary of what’s in this newsletter — with more details and links to further information, flyers, and registration below. Survey — ECE challenges & best supports, responses needed today Friday, March 15! NAEYC: Professional Learning Institute – June 2-5, Early Bird registration now open! What does San Francisco’s budget and budget advocacy look like? Highlights of the Budget Justice Coalition training, key dates and where does early care and education fit? Guest presenter, Claudia Quiñonez, will share Children’s Council’s newly launched Child Care finder. Take a look with at the new features — and take part in limited time free professional editorial and photography. See details here. More details and registration for the ECESF meeting. 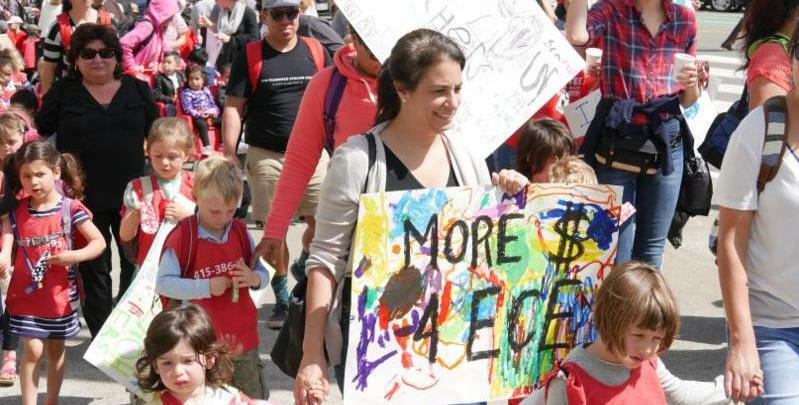 Come together with the SF ECE community to let our elected leaders know how important Early Care & Education is for San Francisco now and our future. ECE quality and availability depends on educators — we need pay parity with K-12 to retain and attract early care educators. Walk Around the Block kick's off at 10 am at the California State Building (Early Warren Building), 350 McAllister Street Steps. Share this save the date flyer with your community! The California State Team on Behalf of National Governors Association (NGA) and the Council of Chief State School Officers (CCSSO) requests your participation in two surveys. The surveys ask for your input on what supports are most helpful to you, and what challenges you may be experiencing. You may take the survey in either language, but please do not complete both languages for one survey. We respectfully request that you complete both surveys by March 15, 2019. More information and things to know before taking the survey. The OECE Citizen’s Advisory Committee (CAC) is a nine-member group appointed by the Mayor and Board of Supervisors to advise OECE on its work and provide strategic input. More information on meetings and CAC members. EDvance, First 5 San Francisco, and the i3 Institute are partnering for the upcoming event, the “Festival of Learning” Inquiry Symposium. You are welcometo attend the event, invite your social networks/communities, and present/display a poster. See more information for presenter applications (due March 30) and poster guidelines here. CPAC’s annual ever-popular Week of the Young Child Early Educator Recognition Event. Because of room capacity, this event is by invitation only, one person per invitation, and for early care educators. Did you receive you invitation? Respond as soon as possible as space if filling up. The San Francisco State CAD PATH program will be hosting a PATH info session on Thursday April 11 th from 5:30 – 7 pm in Library 222, SFSU. The Path program is also available to provide one-on-one appointments to anyone in the workforce who is interested in PATH, please reach out to Christine Nevarez, path@sfsu.edu or cnevarez@sfsu.edu , or 415.405.4340. For flyer and map to meeting event. Summer enrollment for summer school to start April 2019. This summer, FREECCSF is in effect. CCSF is free for SF residents. Do you have employees or members of the workforce that need general education classes for their permits or to graduate? Fall 2019 courses funded by OECE for GE completion to include a GE cohort offering of Psych 5 (Statistics) and English 1A, as well as other GE classes for the CDEV workforce, offered on evenings or weekends. OECE-funded GE classes meet graduation, transfer, and CDEV Permit requirements. Embedded ESL faculty as well as tutoring available. For information on Fall 2019 GE classes contact kwildman@ccsf.edu. 415-452-5605 to make an appt. for an Educational Plan, a Graduation or Certificate Petition or for Transfer assistance! For Pathway and Special Program information in the CDEV Dept. contact Kathleen White at kwhite@ccsf.edu . Early care educators! Did you know that ECE SF has funds to support your participation— or educators at your site — in conferences and meetings relevant to ECE? Attend an event and bring key highlights back to the ECE SF community. See our ECESF leadership program here. See two upcoming conferences below.